A ceasefire agreed in June aimed at halting the Central African Republic’s five-year conflict barely lasted 24 hours. 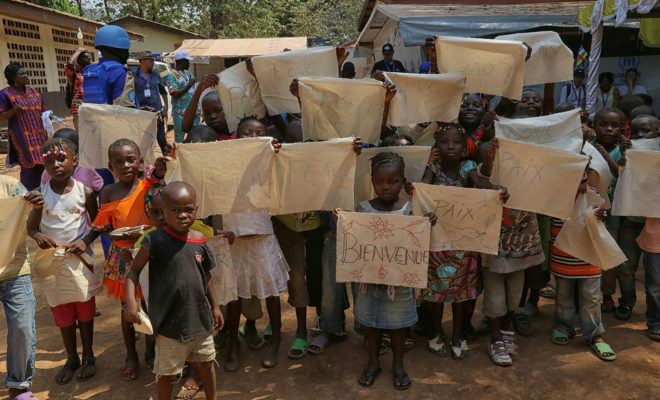 Children in the capital Bangui hold up signs reading “Peace” and “Love”. Credit: UN Photo/Nektarios Markogiannis. The ancient gilded room of a Catholic community group in Rome was perhaps an unlikely setting for a crucial meeting on the Central African Republic (CAR). But this June, representatives from the Central African government and 13 armed groups gathered in the headquarters of the Saint’ Egidio peace group where they signed a peace accord. CAR has endured several conflicts both before and after gaining independence in 1960. But the unrest sparked by the ousting of President François Bozizé in 2013 has been particularly intense and long-lasting. In March 2013, members of the Séléka rebel group seized power with support from neighbouring Chad and Sudan. Bozizé had himself come to office in a coup a decade previously. This power grab led to widespread clashes between the Séléka and local self-defence militias known as the anti-Balaka. These community forces were later joined by former members of the national armed forces. In the years since, various ceasefires and peace deals have been signed. An interim government was established in 2014, and elections in 2015-6 saw President Faustin-Archange Touadéra come to power. Yet the violence has continued and evolved significantly. The peace accord signed in Italy on 19 June was intended to finally stem this fighting and included 13 of 14 recognised armed groups. But any optimism soon faded. Barely 24 hours after the signing, deadly clashes had broken out once again.CAR’s continuing conflict has now led to thousands of deaths, left over half of the 4.9 million population in need of humanitarian assistance, and displaced a million people. It has also created thousands of child soldiers. Since the conflict started in 2012, the UN estimates that at least 13,000 children have been recruited on both sides of the conflict. Many suspect the actual number is higher. A UN report this May reveals the shocking treatment these children face. It documents girls as young as six being abducted by militias. It finds that children are “often subjected to acts of sexual violence and ill-treatment, and used by armed groups as human shields”. A large proportion of child soldiers are kidnapped by armed groups, but many join “voluntarily” to protect their communities. This is particularly the case with anti-Balaka groups, many of which are poorly equipped and organised, but emerged at the local level for self-defence. Some children join to avenge the death of a loved one or as a response to other atrocities they have suffered. Others may join believing armed groups present a route to a better life and income. One 17-year-old girl told the UN how she joined the anti-Balaka to avenge her father’s death, but was exploited and abused. The UN’s own peacekeeping mission in CAR (MINUSCA) has also faced allegations of sexual abuse against women and children since it was mandated to restore stability in 2014. In 2015, UNICEF brokered a deal with the country’s armed groups to release 10,000 child soldiers – variously exploited as combatants, cooks, spies, porters, or for sexual purposes – and commit to stop further recruitment. UNICEF’s figures suggest that most of these children have now officially been demobilised. But with violence ongoing, there is a high risk that these children could be re-recruited. Another 3,000 new cases of child recruitment were reported in 2016. And there are alarming reports of families paying ransoms for children to be released by militias, a practice that increases the profitability of abductions. This problem is compounded by the fact that only half of the demobilised 10,000 child soldiers receive reintegration support. At the same time, the government’s limited financial resources and lack of influence outside the capital mean that it has yet to roll out the full disarmament, demobilisation and reintegration (DDR) programme promised by the 2015 Bangui Forum. This has left tens of thousands of adult combatants waiting expectantly and increasingly impatiently too. But most groups may in fact be excluded from the programme, which – among other requirements – stipulates that a “weapon of war” must be handed over to demonstrate eligibility. These difficulties and delays around DDR support have led many anti-Balaka groups to turn to crime such as armed robbery to sustain themselves. They continue to use children for these activities. For the children freed from armed groups, returning to a normal life is fraught with challenges. It is not uncommon for children to suffer discrimination and rejection by their family. Girls formerly associated with armed groups are especially vulnerable to abuse from community members and are often derided because of the sexual abuse they suffered. Such experiences are similar to those endured by former child soldiers elsewhere in the world, but for those associated with anti-Balaka movements, reintegration brings its own unique obstacles. Because these movements are formed by local members to protect their own villages and towns, the child recruits often stay at home rather than following the group into the bush (as is more common for children in ex-Séléka groups). Further, given that local groups have not yet been formally disarmed, children may remain under the influence of their former commanders even once they have officially been demobilised. The looming armed presence overshadows a child’s return to civilian life and offers little reassurance they can avoid re-recruitment as soon as violence returns. Child Soldiers International works to help strengthen these reintegration practices through advocating for integrated approaches, which address the grievances and needs of both the children and the community. Together with our partners, the organisation develops awareness-raising material to prevent child recruitment and help communities better protect their children. Ending child recruitment is critical to restoring peace in CAR. This will be a long and complex process and sadly, it seems that the latest peace agreement is not the catalyst to ending the conflict that many were hoping. To stop the exploitation of children in adult wars, the government will need to find ways to address the armed groups’ grievances but also hold those who recruit children accountable.